So my mom said get a skirt because in a lot of shops, in particular Miss Selfridge and Forever21, there were some real cute skirts. So I ended up buying two. 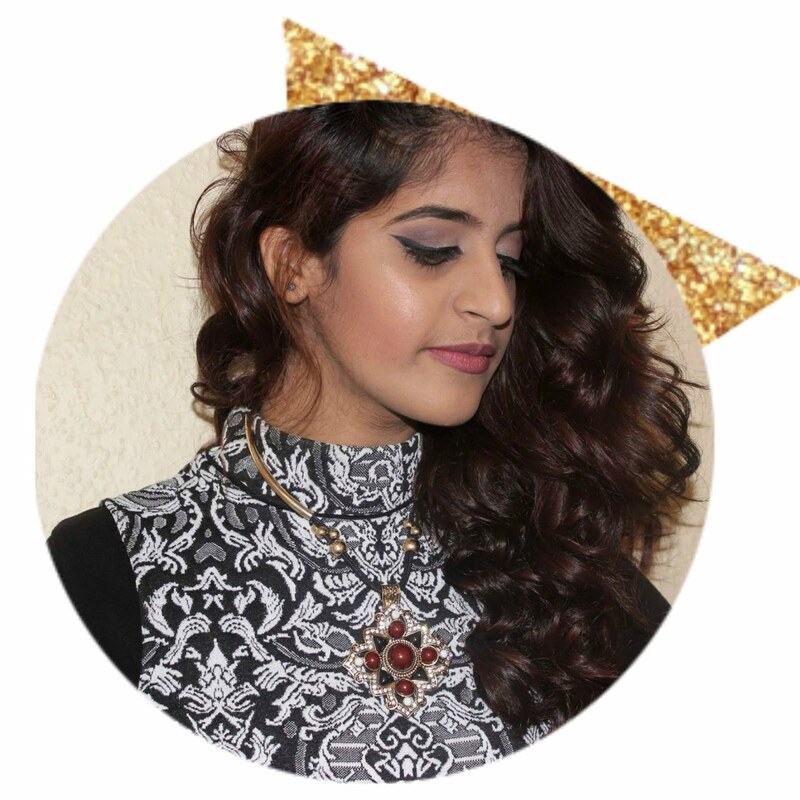 Firstly I'll list, with pictures, everything I bought then I'll go into the OOTD side of it! 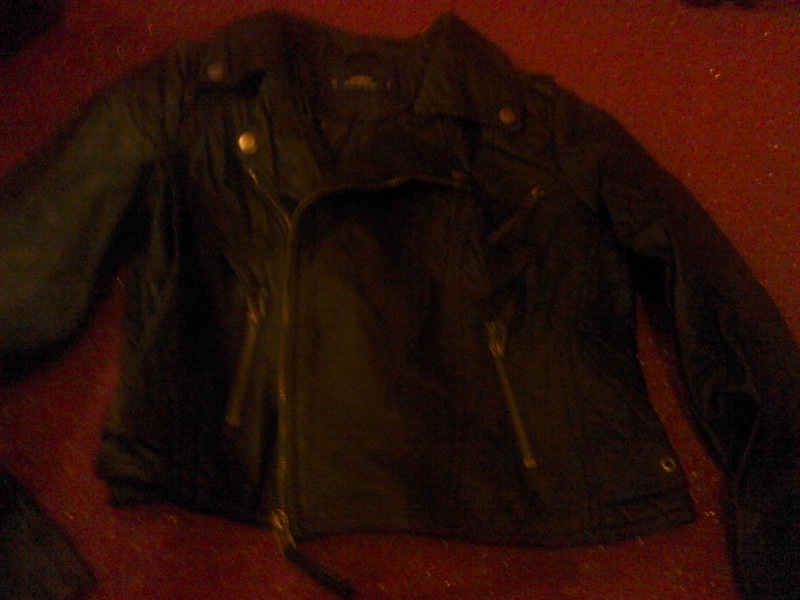 The first thing I got was this leather jacket. I had one a few years ago but obviously I grew, it shrink so yeah I decided I needed a new one. This one is from Miss Selfridge for £52. I really had to bite my lip when buying this, even though my mom was the one paying. I said to her we'll go somewhere else and try to get a cheaper one but she insisted saying that the one I got before cost around that price and she said it would be worth it if I wear it a lot, which I knew I would. So yeah that's the 1st thing I got. 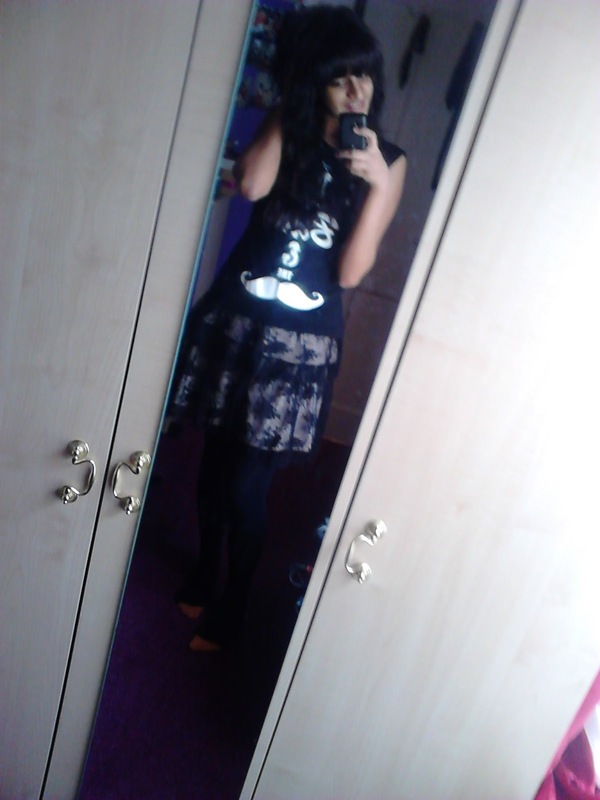 The second thing was a short black lace skirt. Like I said I decided to get a skirt and well first I got the one below and then when I went to Miss Selfridge my mom saw this one for £32 but when we payed for it turned out it was on sale for £10. My mom loves a bargain lol, she didn't mind paying the £32 but I felt better that it was less because she was already spending a lot for me that day. It was totally my style, black and I liked that I could pair it with pretty much anything. 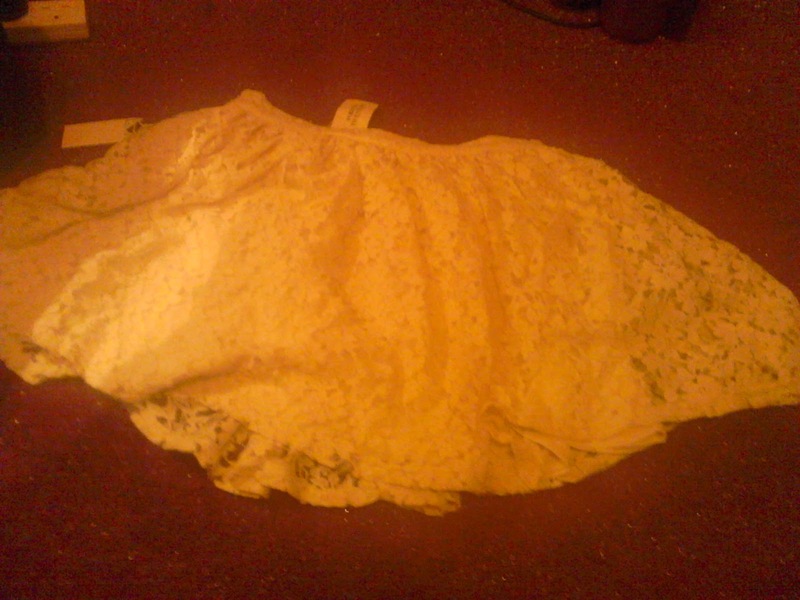 The first skirt I got was this short white/cream lace one from Forever21 for £14.75 and I don't know if this helps anyone but its from something called the Capsule Collection? Anyways I really liked it because it looked feminine and girly which isn't usually my style but I thought it was good to switch it up a bit. I really like it as it can be causal or dressy, it just depends on how everything else is paired with it. 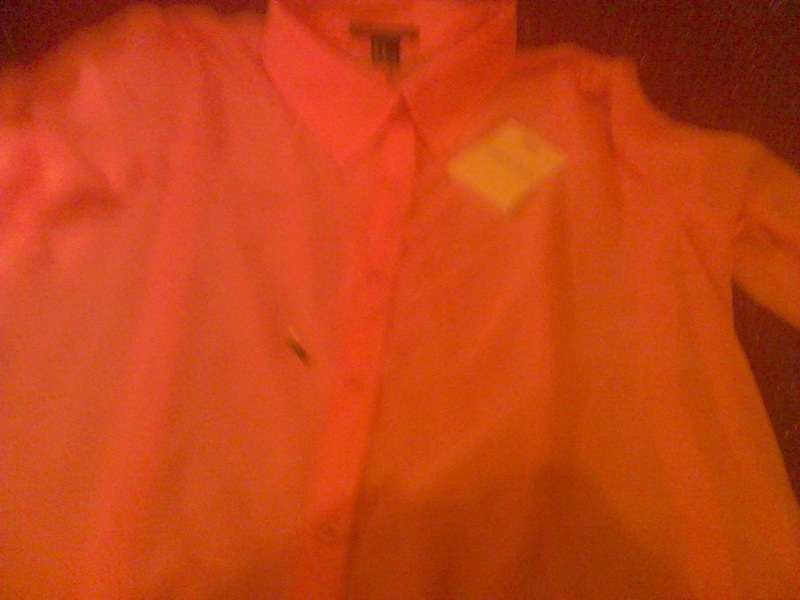 The last thing I bought was this sheer pink/coral high-low hemline blouse also from Forever21 for £10.50. I don't exactly live in LA where the weather is on the increase. 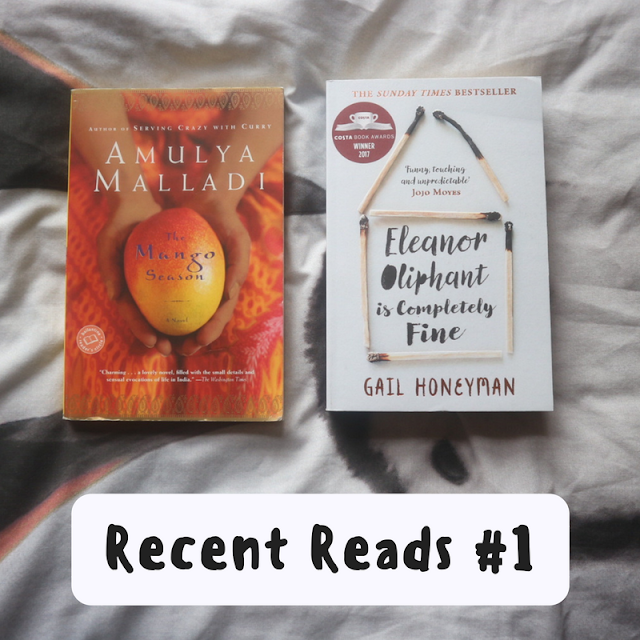 I like in the wonderful UK with typical cold/snowy British weather but oh well, I loved it and I wanted to add some colour to my wardrobe for two reasons. One, it is spring, even though it doesn't feel like it, so to get me into that spring vibe colour is fantastic. Two is that my wardrobe consists black, brown, white, red, purple, dark blue, mainly so I just needed some colour. I also got a moustache necklace which is placed over the top in the picture from Forever21 for £1.65. I have recently had an obsession with moustache stuff so when I saw it on display at the counter I just had to get it. Then I obviously needed a little bag. But I thought I'd just use some random bag from home. Whilst me and my mom were waiting in the line to pay, I saw a bright orange thing and it caught my eye. 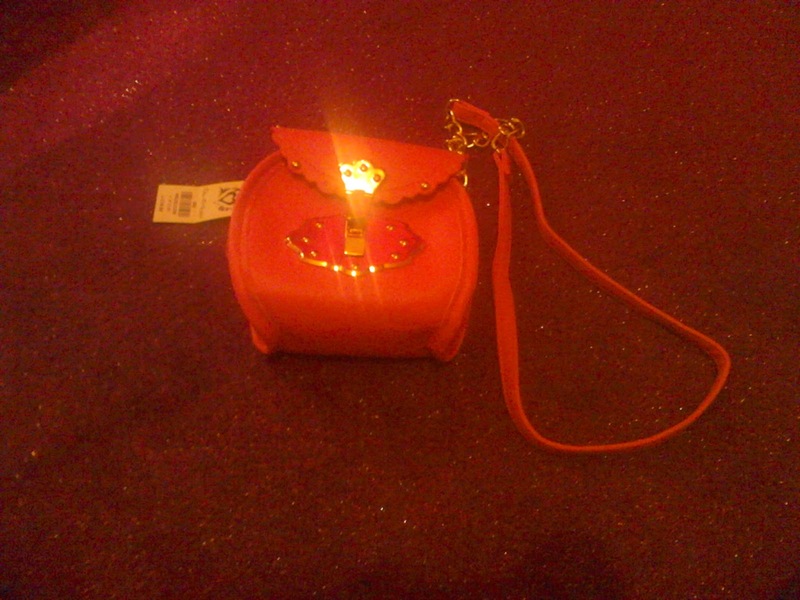 I quickly ran over to it and saw this orange chain bag and begged my mom if I could get it. It was also from Miss Selfridge and cost £18 but my mom agreed so I was happy!! 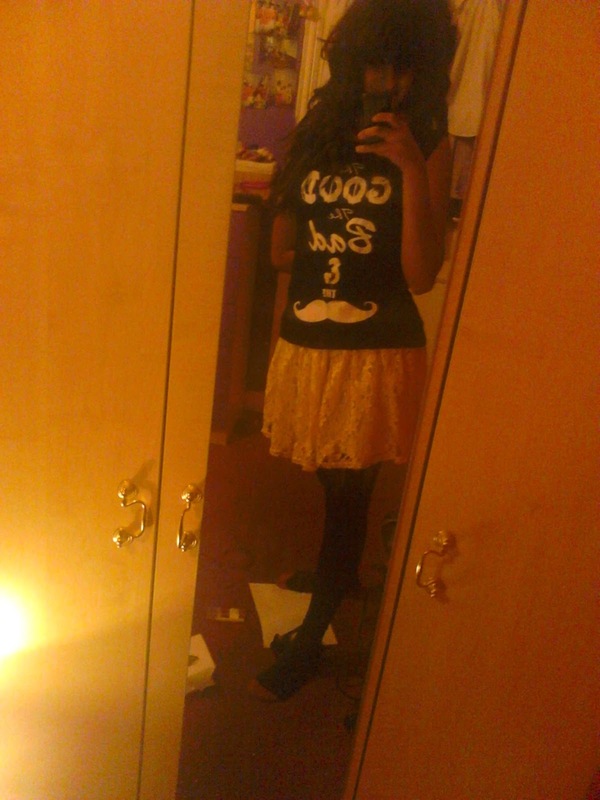 I also got this real cool MOUSTACHE top whoop! More moustache stuff. 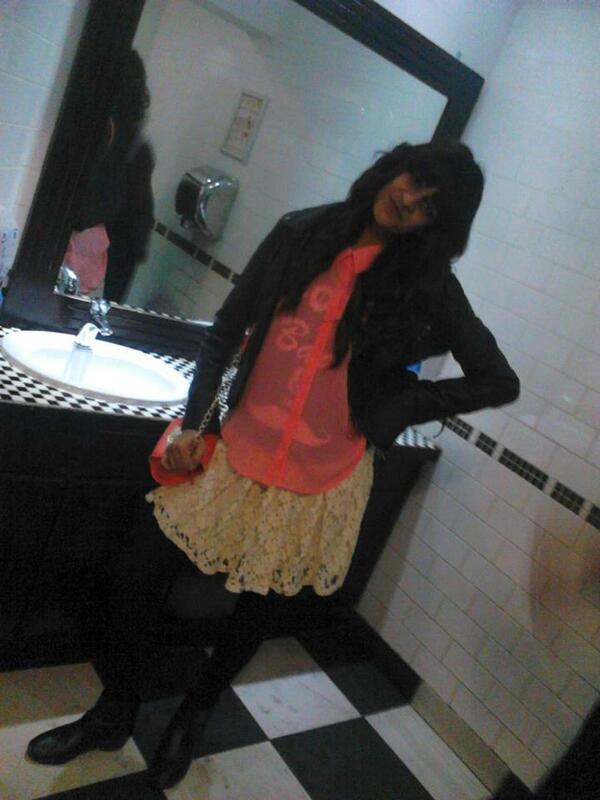 I actually bought it a week or two back but I wore it underneath the pink blouse since it was so sheer. Basically the top said "The Good The Bad & Moustache" from the Clearance Centre for £10. 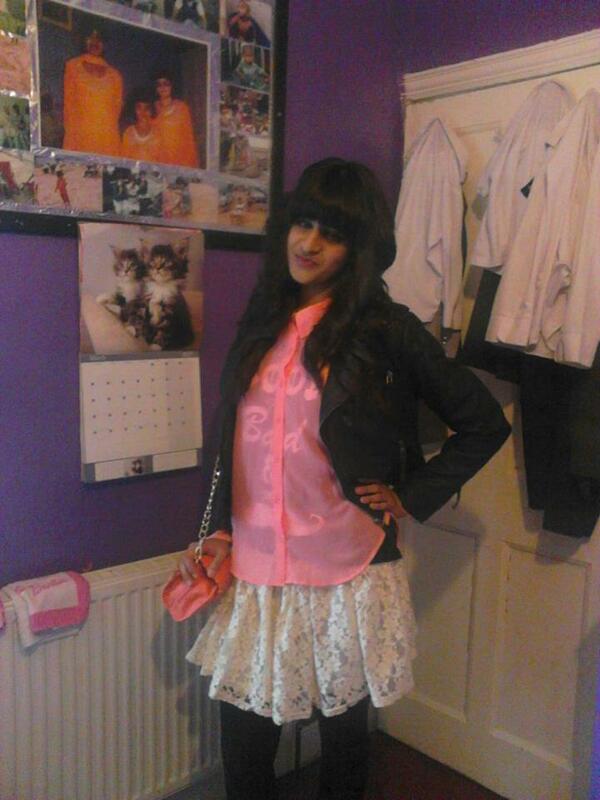 Anyways as soon as I got home I was desperate to take photos to show my bestie how my outfit would look. I made her help me pick which skirt to wear to the restaurant. I had no idea which skirt to choose. In the end we settled on the white one as it added more of a girly touch. 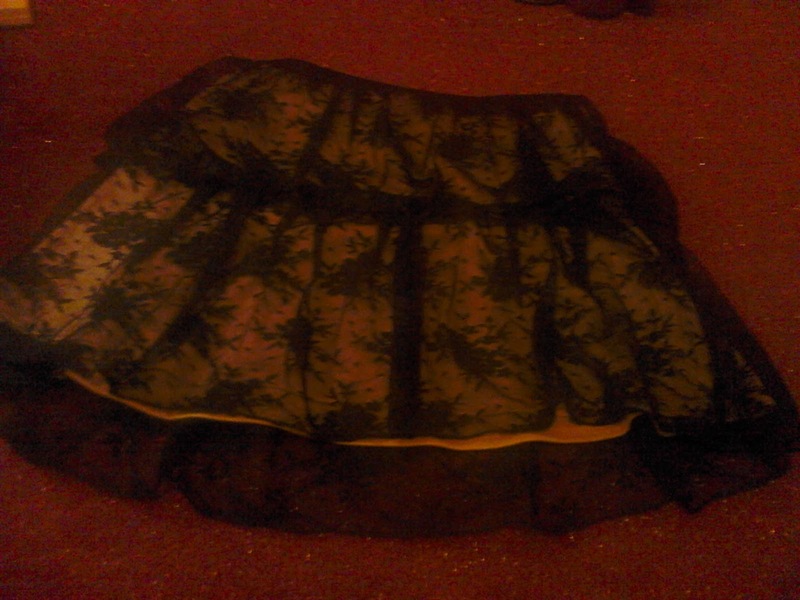 Anyways here is a photo of the back skirt. It really fits in with my personal style and I am currently wearing it because I actually like it a lot more than the white one. It just looks so cool! Don't really like these photos but these were the only ones of me on my own so oh well. But as you can see I am wearing the white skirt and I just paired the look with black tights and my normal everyday black ankle boots because I felt the need to spice it up a bit more I mean the leather jacket pretty much did that but you know I just wanted that little bit extra. So these ain't the clearest pictures. The first one on the left is right before leaving the house and the 2nd one was before I did my hair and make-up.